With Venezuela set to face Jamaica and Peru in international friendly matches, what follows is an in-depth look at their squad and likely starting XI for the first clash. It is politely recommended that before reading this article, visitors take a look at this preview of the two clashes which helps to put the following into context. 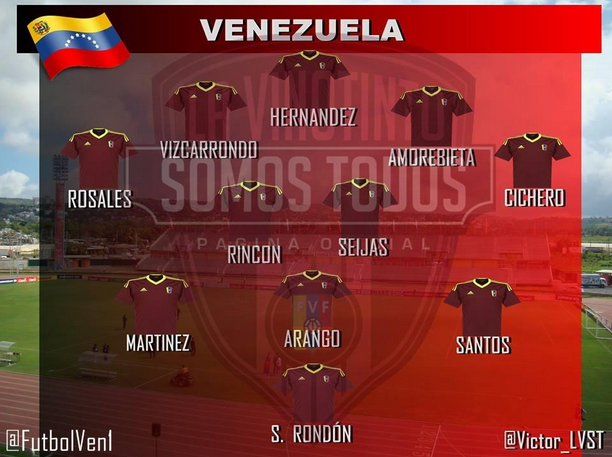 This graphic, based on how the players have been organised in training this week, is believed to be Venezuela’s probable line-up in their first game, which is away to Jamaica. The subsequent analysis and information regarding the squad is thus structured according to this predicted XI. UPDATE: Just under an hour to kick-off until the Jamaica game, the starting line-ups have been announced and Venezuela’s had two changes to the above graphic, with the more defensive Franklin Lucena playing in front of the back four instead of Luis Manuel Seijas and Mario Rondón starting on the right instead of Josef Martínez. The two Rondóns thus get the opportunity to link up again. Irrespective of these changes, the article below remains unaltered as it was only ever intended as a broad, if detailed, guide to the players. Hispanospherical.com has enormous – perhaps misplaced – faith in its readership to engage their brains when encountering the two discrepancies as there is more than enough information provided to assist with filling in the necessary ‘gaps’. So, whether you are coming to this article before, during or after the game, feel free to read on if you would like to know more about the leading Venezuelan players currently in contention for those vital Copa América squad places. These will be the seventh and eighth games of manager Noel Sanvicente’s reign since taking over in July 2014. A brief summary of their first six matches can be found in the preview article and all the match reports with highlights can be found in this section, but here is a quick recap: In September on a tour to Asia, they lost 3-1 to South Korea, then drew 2-2 with Japan which, due to the fielding of an ineligible player, was later reversed to a 3-0 win in the hosts’ favour. November’s depleted squad, which had no fewer than eight regulars ruled out, suffered predictably disastrous results: a 5-0 thrashing at the hands of Chile and a 3-2 loss away to Bolivia. In February, La Vinotinto notched their first two victories – both against Honduras, 3-2 away and 2-1 at home – though as these two games were contested solely by players based in the domestic league, they can be viewed as B internationals. Thus, the current crop of players is undoubtedly the strongest yet that manager Noel Sanvicente has had the fortune to work with. Please read on to find out more about them and their respective places within the squad. Though manager Noel Sanvicente has largely preferred to kick-off games with a 4-2-3-1 formation, it has at times appeared to morph into a 4-4-2 (or, to be more specific, a 4-4-1-1, utilising a support-striker). Nevertheless, based on how they have lined up in training this week (see graphic at the top of the page), it is believed that against Jamaica at least, he will go with a 4-2-3-1. Dani Hernández is the first-choice between the sticks and though it is unlikely that he will be usurped, he should not be feeling too comfortable just yet. His performances in the four international games he played in September and November were marked by several unconvincing moments, as he did little to inspire reassurance with his often faulty positioning, dubious handling and poor clearances. Sanvicente has commented upon this but believes that Hernández being second-choice at that time for his then-club, Real Valladolid, may have affected his confidence. Having since moved to fellow Spanish second-tier side Tenerife in January and played in ten consecutive games – conceding nine goals, as opposed to the 24 in the preceding 20 matches – it is hoped that this time around he will serve as a more assertive last line of defence. His understudy, 25-year-old Alain Baroja of Caracas FC, only received his first two caps in the pair of games contested solely by home-based players against Honduras in February but it was notable that he played all 180 minutes of these. Indeed, his rival Rafael Romo was somewhat surprisingly not granted a solitary second on the field and has since gone on to make some costly blunders for his side Mineros de Guayana in the Copa Libertadores. Thus, Baroja’s status as the new number two appears assured and though he is not anticipated to start against Jamaica, he may well see some action against Peru. It is beyond doubt that Sanvicente will start with a conventional four at the back. Given how porous his side has been in previous encounters – officially, 17 goals have been conceded in his six games in charge, with not one clean sheet – some different personnel and defensive relationships are surely needed and that appears to be what he has decided upon. First-choice centre-back, the towering Oswaldo Vizcarrondo, has been a beacon of reliable consistency for Nantes this season, playing almost every minute of every game. It can not be said that this form has been replicated at international level where goals have leaked in abundance, though to pin this squarely on him would be unfair. His partner for all four games that he played, Grenddy Perozo – who, at club level is in danger of enduring a second successive relegation with Ligue 2’s Ajaccio – has been more culpable, something Sanvicente appears to have recognised as he has not called him up this time around. Instead, he has sought a future partner for Big Viz and his quest for a replacement has taken him to the not-so-distant past, with the call-ups of Fernando Amorebieta and Andrés Túñez. The former is rumoured to be starting against Jamaica though his level of fitness as well as his ability to rekindle his past form and partnership with Vizcarrondo raise more than a few doubts. Indeed, he has only played seven games this season in the Championship, having first been frozen out by then-manager Felix Magath and then, after he had won a spot in the line-up, suffering two spells out with injury, the second of which lasted four months. When he returned to action earlier this month in a 5-1 home defeat against title-challenging Bournemouth, he was played in his less-favoured left-back position and looked horrendously off-the-pace and out of position, with his dismal night ending in a 69th-minute dismissal. If he is unable to do the job then Túñez, who in November won the Thai league title and has recently been playing in the AFC Champions League with Buriram United, stands a considerable chance of being more than a mere back-up. Furthermore, Sanvicente has spoken of his desire to try out different options at the back, though where this leaves 35-year-old Juan Fuenmayor of Deportivo Anzoátegui – a surprise call-up even in last month’s domestic squad – remains to be seen. Gabriel Cichero appears to have this position sewn up. The experienced Mineros de Guayana lateral is the only player to have played every single minute of Sanvicente’s reign, though his early performances did see him upbraided in various quarters. Indeed, though after each of the first four games almost all seven players in defence-minded positions (goalkeeper, four defenders and the two defensive-midfielders) came in for criticism, the opprobrium levelled at Cichero was especially severe. In the hammering meted out by Chile, in particular, he struggled to deal with attacks down his flank, granting opponents more than their fair share of space. However, since then he has enjoyed two rather composed games against Honduras (even having a hand in one of the goals) and, domestically, though his club side have been underperforming all season, he has managed to chip in with three fine goals since the start of 2015. As it is more his defensive game that he is going to be judged upon, if he can carry his performances from last month’s domestic-players-only friendlies into these two more illustrious affairs, the calls to find a replacement will surely go on mute. That said, he appears to face no current threat from inside the current squad, even if both Amorebieta and Fuenmayor have experience of playing in this position (and may well be given a run out here). FC Thun’s Alexander González played here for three of the first four games, yet it is looking like Roberto Rosales will instead start against Jamaica and thus reclaim what many feel is rightfully – and naturally – his. Indeed, despite the Málaga star being, by trade, a right-back, he was placed in a defensive-midfield partnership with Tomás Rincón in Sanvicente’s second game against Japan – partly as a measure to avoid getting as easily overran in midfield as they did against South Korea. It seemed as if this arrangement would continue in November’s friendlies but as both men were ruled out through injury, it never had a chance to come to fruition. Now several months on, it appears as if Rosales’ exemplary form in his debut season in Spain has influenced Sanvicente’s decision-making. What no doubt would have swayed the boss was Rosales’ fine performance in February at Camp Nou, where he kept Neymar quiet all game in a surprise 1-0 victory – the second occasion he had helped his side keep a clean sheet against Barcelona – which no doubt also influenced the La Liga panel that voted him into the league’s official Team of the Month. Given that González tends to play in a more advanced position in Swiss domestic action and, more pertinently, Rosales will again be facing the Brazilian lead man in June, reverting the Málaga man back to his natural position seems almost a non-brainer. Due to Rosales’ alleged shift, it appears that, rather than using two defence-minded players to cover the back four, Sanvicente will instead first be experimenting with two contrasting individuals in a doble pivot of sorts. Whether this will seem quite as appealing against the likes of Brazil is a question for another day. (UPDATE: see the update at the top of the article regarding a late change in this area). Tomás Rincón is the vice-captain of the side and will be greeted back into the line-up with open arms, having only previously featured in the first two games in Asia. At club level, he has enjoyed a broadly positive debut season thus far with Genoa, featuring in approximately two-thirds of their league games, helping them defy various odds to sit in the top half of the table. His ability to roam around the middle third, breaking up play with key interceptions and tackles should add some bite and composure that has thus far been sorely lacking, particular in November’s embarrassing 5-0 loss against Chile. Indeed, the Mineros duo Édgar Jiménez and Rafael Acosta started that day and, not for the first time in Sanvicente’s reign, were widely panned. As they do not feature in this squad, they appear to have played their way out of the coach’s plans, with the fortunes of another home-based player, Deportivo La Guaira’s Franklin Lucena, seemingly moving in the other direction. The now 34-year-old may well have initially been considered too old for a new qualifying cycle but, having been granted his first start against Bolivia following the Chile debacle and then playing every minute of the friendlies against Honduras, he seems to have earned his place as the number one reserve to Rincón. If Sanvicente scraps the doble pivot idea at any point and instead goes for a more defensive arrangement here, Lucena would surely be in line for a start. Another player who will hope to be considered for this position also plies his trade in the domestic league and is a club team-mate of Lucena’s. 26-year-old Arquímedes Figuera received a rare call-up for the Honduras games and even scored a similarly rare goal, though he must be considered as no more than an outside bet to be included in the final Copa America squad. However, one factor counting in his favour is Sanvicente’s apparent fondness for selecting home-based players who play on a regular basis as opposed to those who spend large periods of time on foreign benches, such as Empoli’s Franco Signorelli, who has been overlooked this time around. According to the reports, Independiente Santa Fe’s Luis Manuel Seijas has been earmarked for this position. Although this reigning Colombian champion tends to play further upfield, this role should not be out of his realm of experience and abilities. Formerly of Standard Liège and with over 50 caps to his name, Seijas is one of the most familiar faces at international level of the current crop and is more than capable of spraying searching long-range passes with his cultured left foot. It will be interesting to see what effect this supposed new arrangement in this area has on the team’s play. If Sanvicente wishes to try someone else in this position, the similarly versatile Alejandro Guerra – who also plays in Colombia, albeit for Atlético Nacional – seems a reasonable bet, as does even the veteran Juan Arango, though more on these two later. One man who could very well be a long-term fixture in this position is 21-year-old Juan Pablo Añor, or Juanpi, as he is more commonly known. Having this season made his debut for Málaga, he has inspired much excitement with his confident, somewhat balletic, poise on the ball, which he utilised to sensational effect when he scored his first goal, a superb left-footed strike into the top corner against Levante. He has often featured in a deep-lying playmaker role for his club, though, not too dissimilar to the two aforementioned players, he is also capable of playing further upfield, which he demonstrated impressively in his youth career, scoring at a rate of one in every two games. However, while he is a definite talent, those clamouring for him to be fast-tracked into the line-up must acknowledge that it may be a case of too much too soon for a player who has a mere nine senior club appearances to his name (three of these as a substitute). Nevertheless, having been called up to this squad as a late replacement for home-based starlet Rómulo Otero, he will understandably take any opportunity, no matter how it comes to him. This area of the field is undoubtedly the strongest and most competitive, providing Sanvicente with regular selection headaches that ultimately involve having to leave out at least a couple of seemingly deserving candidates who play their domestic football at a respectable level. While the Venezuelan game may well just have a knack of producing a relatively high number of such players it is also possible that the contemporary trend to play with one up front means that there is an excess of attackers who have learned to adapt their game out of necessity, thus adding to the competition for these three places. Indeed, as will later be expanded upon, there is really only one player officially listed as a forward in this squad who would not also be in contention for a role in this area. Nevertheless, despite all this talent, La Vinotinto have not shown a great deal of attacking cohesion and fluency under Sanvicente – will these two games provide a turning point? Of all the rumoured starters in this line-up, the anticipated occupant of this position will be of keen interest to many, being as it will be his international debut. Naturally, with this incursion someone has had to make way and this appears to have been Luis Manuel Seijas who, as noted, has been redeployed elsewhere. Furthermore, given the versatility of many of the players in this area, the number of players who could also be tested on this side at some point in these two games is high. César González, Juanpi and even Juan Arango are all viable possibilities, as is the erstwhile golden boy, Ronald Vargas, though, like González, he would admittedly be more at home on the opposite side. However, while he is more naturally right-footed, he has been known to cut inside from the left and vice versa. Given Chita‘s propensity to play people in positions different to where they feature at club level, coupled with the contemporary fondness for inverted wingers, an appearance at some point on either flank seems probable for the Balıkesirspor wideman. Nevertheless, regarding the debutant golden boy in this position, Christian Santos, his noted aerial prowess certainly gives him an additional dimension over most of his rivals and all La Vinotinto fans will be eagle-eyed to see if his scintillating club form translates to the international stage. With Nijmegen’s N.E.C. in the Dutch second tier he has shown himself to be a prolific scorer as well as a creator of goals and, on paper at least, he would appear to have a strong chance of worming his way into a regular first-choice XI. However, given his ability to play anywhere across the attacking midfield area as well as in a more forward role, it is certainly not inconceivable that he and one of his supposed competitors – perhaps Seijas, possibly Juanpi – may well end up lining up within the same team in the future. Predicted to be in the centre is creative veteran, undisputed free-kick master and icon of Venezuelan football for the past decade, Juan Arango. Leaving the Bundesliga in May 2014, he returned to a previous club of his, Mexico’s Xolos de Tijuana, yet only since the turn of the year has his season really taken off there. Indeed, after his side endured a rather disappointing Apertura campaign, he has been at the forefront of a remarkable turnaround that now sees them top of the Clausura, with the Venezuelan having contributed 5 goals and 2 assists. However, though his neat interplay and particularly his long balls, efforts from distance and crosses are still valued weapons, with his 35th birthday less than two months away it may be that his international future lies a little further back in midfield. Indeed, this is how his club manager Daniel Guzman has fielded him in order to precipitate such fine form and it is something that Sanvicente has expressed his admiration of. Again, when it comes to potential alternatives in this area, there are at least a few possibilities, with these including Josef Martínez, Mario Rondón and Christian Santos, among others. Yet, had he not been ruled out by a late injury, then Caracas’ Rómulo Otero would have possibly been in line for a substitute appearance in this position, though he does also work the flanks. (UPDATE: see the update at the top of the article regarding a late change in this position). According to the alleged line-up, Torino’s Josef Martínez is likely to start on the right of this triumvirate. Still not 22 until May, he has, on occasion, demonstrated what an energetic livewire and clinical finisher he can be with the Serie A side, albeit usually while playing as a striker or support-striker. He possesses just over a dozen international caps and though he has not yet managed to claim any regular spot in the line-up as his own, he has enough raw talent for most fans to believe that if he can just channel it to his advantage then he will be a regular fixture in this side for at least several years to come. Martínez’s most likely competitor for this spot on the right is Alejandro Guerra, who started the two games in Asia before injury ruled him out of the November clashes. He, like Arango, has had a promising start to 2015, scoring four goals in five league games for Atlético Nacional, as well as a fine scissor-kick in the Copa Libertadores. Nevertheless, given that both he and Martínez can play in more than one position, Guerra’s spell on the sidelines may only prove to be a temporary displacement and fans can be sure that he will get at least one opportunity on the field over these two games. Not quite so much certainty can be attached to the predicament of César González. The 32-year-old Deportivo Táchira winger – who has been known to play on either flank – has not featured in any of Sanvicente’s squads so far, though with over 50 caps to his name, he is no stranger to the international fold. His last call-up came in late 2013, yet despite his age it appears that the coach could not resist him in his current form, as he has netted 6 goals in his last 7 matches (including 2 in the Libertadores), not to mention providing several assists from dead-ball situations. With this latter quality in mind, it may be better to use González as a potential replacement for Arango – who has often been withdrawn when displaying signs of fatigue after 60-70 minutes at club level – as his set-pieces would be warmly greeted by the head of the man who is scheduled to make his first start on the opposite flank – not to mention a certain gentleman up front. As already noted, there are several players who can play in this position but only really one who is considered a pure striker. That man is Zenit St. Petersburg’s Salomón Rondón, the current joint-top scorer in the Russian Premier League and the undisputed focal-point for his country. After a lengthy barren spell at club level provoked whispers that he may be on the way out, he has recently returned to something approaching his clinical best, having scored twice against PSV Eindhoven in the Europa League and netting a domestic hat-trick at home to FC Ural. Though some doubts over his consistency and future may persist in St. Petersburg, at international level he can be assured of his status as Venezuela’s top man. This week, however, there have been some rumours leading up to the Jamaica game that he has been nursing some kind of injury and that his namesake Mario Rondón would instead be starting. Though this now appears not to be the case, spectators can expect to see at some point the man who has recently swapped Portugal’s Nacional for China’s Shijiazhuang Ever Bright. Indeed, he played in all four of the previous games open to overseas-based players and, in the first two in particular, was many observers’ stand-out player, contributing two goals. Previously, he had not received many chances under the former managerial incumbent César Farías (2008-2013) and at 29, still possesses fewer than 10 caps, yet in the two Asia-based games was able to show some signs of a promising future partnership with the Zenit hotshot. As he tends to play more of a supplementary role to the striker, often featuring in a deeper position and/or working the channels, it is very much possible that fans will once again see the two Rondóns link up for their country. Whether or not it will be in this international week remains to be seen. Regarding the very last person in this squad, Richard Blanco of Mineros de Guayana, it is hard not to feel that, despite scoring a tap-in in one of last month’s friendlies, he is largely here to make up the numbers. His domestic goalscoring record – 7 in 22 games – is nothing to shout about and vastly inferior to the 18-goal tally of Deportivo Táchira’s Gelmin Rivas, who has not received a call-up. Quite what he can offer that several others can not in a supporting role is not readily apparent either. Thus, come late May, when the players are waiting with bated breath for the final Copa América squad to be announced, one would expect forwards such as Juan Falcón (Metz), Miku (Rayo Vallecano) and Fernando Aristeguieta (Philadelphia Union, on loan from Nantes) to find themselves in with a far greater chance of inclusion. Nevertheless, it is Salomón Rondón who is the likely starter up front. Having so far only featured in two games of the Sanvicente era without managing to score, a first goal from him, as well as any other signals that all the big names are back in the fold – an Arango free-kick, perhaps? – would be received very warmly by many a Venezuelan. 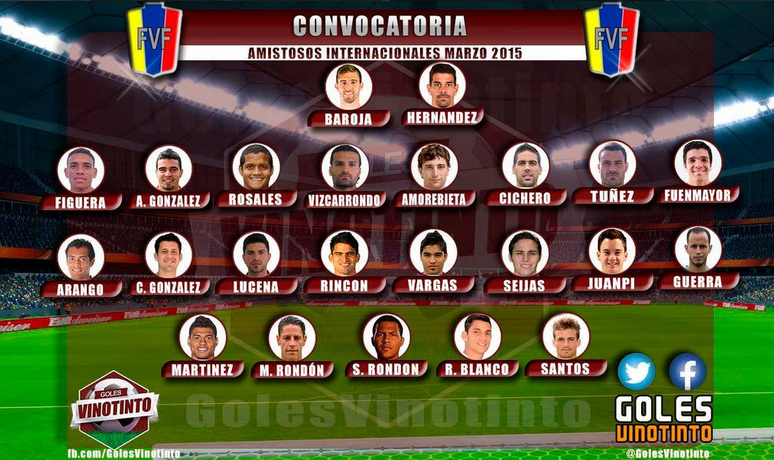 Graphic of Venezuela Squad for March Friendlies (created by @GolesVinotinto). Please note: not all the positions are accurate – e.g. Figuera’s actually a central midfielder – and almost all the players are more versatile that can be conveyed in such an image. Still, it helps to put some faces to names. This entry was posted in Venezuela National Team and tagged Alain Baroja, Alejandro Guerra, Caribbean Football, CONCACAF, CONMEBOL, Fernando Amorebieta, Gabriel Cichero, International Friendly, Jamaica, Jamaica Friendly, Juan Arango, Juanpi, La Vinotinto, Oswaldo Vizcarrondo, Peru, Roberto Rosales, Salomón Rondón, South American football, Tomas Rincón, Venezuela, Venezuela Jamaica Friendly, Venezuela Peru Friendly, Venezuelan Football, Venezuelan football in English on March 27, 2015 by hispanospherical.